The snow certainly arrived but thanks to Team Adlestrop – all the horses were exercised. 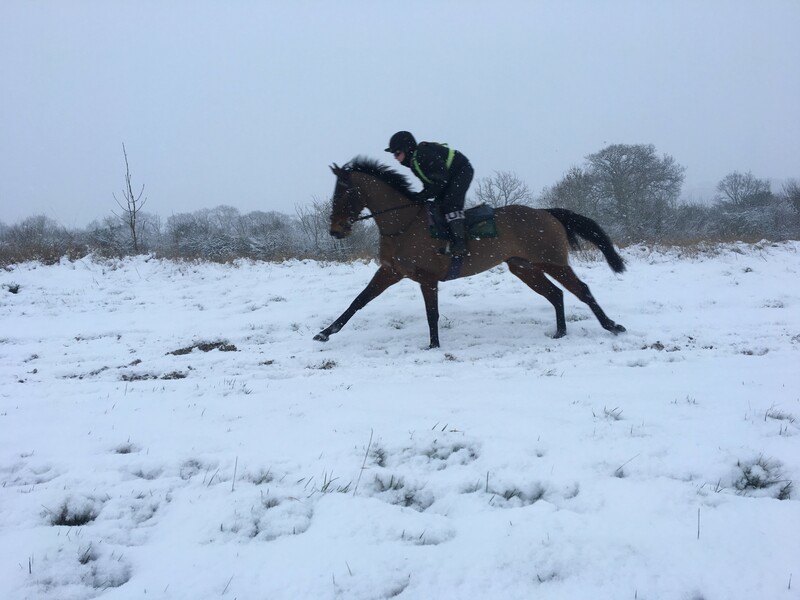 We are very lucky that we have the facilities to keep the horses going in such weather and that our wonderful gallop stands up to all conditions. Hopefully after the weekend we will be back to normal and will have some runners out midweek. It’s interesting how horses tend to run quite well after a breeze up or snow break. Not enough snow to go sledging today down the wonderful Cotswold Hills. It wasn’t that many years ago that all the staff went to the schooling ground on what looked more like a seen from Val d’Isere than Gloucestershire. Apparently the highlight of the occasion was a three foot snowball dumped on the bosses head by jockeys Johnson and Thornton. Where’s the HR department when you needed it.